Cook Family Ancestry Kraemwase of Egypt  This title is just so we know which tree we are working in, as there are many families represented here. Another name for Kraemwase was Khaemweset. It would have been interesting were Khaemwese to have outlived his father, Ramesses II . He would have been king, rather then Merenptah , who's reign seems somewhat bland (perhaps only because it was short). But Khaemwese, the fourth son of Ramesses by his wife, Istnofred (Isisnofret) (her second son), seems to have been gifted, as well as loved and respected for his intelligence, common sense and knowledge of religious matters. He was probably born when Ramesses II was still young, perhaps even before he ascended to the throne. We believe that Khaemwese may have been married to a woman named Nubnofret. Though he died before his father, never having ruled, he was still regarded as one of Egypt's greatest scholars and magicians a thousand years after his death. According to ancient text, Khaemwese earned his reputation because of his talent, intelligence and keen administrative skills. Though he was shown as a young man in a Nubian battle wielding a chariot with his older brother, Amun-her-khepeshef and father, we know of no military titles he ever held. And while he is also shown in a military campaign in Tunip (in western Asia), the position he rose through the ranks to occupy was High Priest of the Temple of Ptah located in Memphis (near modern Cairo ). In one fragment of a stone column now in the Royal Scottish Museum, Khaemwese was described as "...Your beloved son...(the Greatest) of the Leaders of the Artistic Crafts, the Sem-Priest and King;s Son, Khaemwese". Khaemwese wrote in an inscription found in the Serapaeum at Saqqara that he had joined the priesthood of Ptah at an early age and have earned the title of sem-priests a short time later. Sem-priests can be identified by their panther skin robes that are draped over their shoulders. The position dates to the beginning of Egyptian history, and was often held by an elder son of the pharaoh. It was an important position connected with royal funeral ceremonies and so also affiliated with the cult of Osiris. It would take Khaemwese another decade, perhaps in his father's regnal year 25, to attain the rank of High Priest of Ptah. He would then have been in his mid twenties. This office was given significance during the reign of Amunhotep III , who became the first pharaoh to give the office to his son. In fact, Ramesses II probably strengthened the position further. By doing so, he helped offset the powerful priesthood lead by the High Priest of Amun at Karnak. The High Priest of Ptah had grave responsibilities. From a religious aspect, Khaemwese would have not only been responsible for the religious ceremonies of Ptah, but also Sokar ,Osiris , Re, Apis and others. He would have also arranged the king's sed festivals . Khaemwese would have overseen all royal architectural projects, as well as all sculptors, jewelers and artists working on royal commission. In fact, he supervised the building of the Ramesseum at Thebes, his father's mortuary temple, oversaw construction activities in the Great Hypostyle Hall at Karnak , and otherwise supervised building projects at Pi-Ramesses, the capital in the eastern Nile Delta, and elsewhere. He also supervised the building of the Great Temple of Ptah at Memphis. These were all important projects and we can still gaze upon some of this splendor today. In addition, Khaemwese had a great respect for tradition. He made a survey of temples, shrines, pyramids and tombs at many locations around Memphis (very near modern Cairo). Finding many of them on the verge of collapse, he apparently went to Ramesses II in order for approval of a restoration program. This effort resulted in the cleaning and repairing of over a dozen pyramids, temples, tombs, chapels and statues. During this process, Khaemwese wrote on an old statue of an Old Kingdom prince that the reason he took on these projects was "so greatly did he love antiquity and the noble-folk who were aforetime...". "inscribed the name of the King of Upper and Lower Egypt, Unas, since it was not found on the face of the pyramid, because the priest Prince Khaemwese loved to restore the monuments of the Kings of Upper and Lower Egypt.."
In Memphis the god Ptah was represented in the form of a living bull called an Apis. Khaemwese, as the high Priest of Ptah, of course enjoyed an important role in the worship of the Apis bull. He would have supervised the care of this animal during its life, and its burial after death when it was transformed into Osiris. After the bulls death, he became Osiris-Apis, or Osorapis. Apis bulls were honored in death by all of Egypt, and were mummified much like humans in a process that lasted 70 days. The mummification ritual and subsequent burial were so important that an inscription at Saqqara describes Ramesses II's visit on such an occasion in order to actually participate in the event. The Apis bull was buried at Saqqara in a subterranean complex known as the Serapaeum, and it was Khaemwese, as High Priest of Ptah, who had the Serapaeum built. Prior to this, Apis bulls had been buried in separate tombs, but the Serapaeum is a complex corridors and off of those, a series of burial crypts for the mummified bulls. There was also a great temple to the Apis built directly atop these catacombs. Interestingly, if any tomb bears any resemblance to the octopus design found in the Tombs of Ramesses's Sons in the Valley of the Kings, it would be the Serapaeum. "year 30, First Occasion of the Sed-festival of the Lord of Both Lands, Usimare Setepenre [given life forever. His Majesty decreed that] the jubilee-festival should be proclaimed in the entire land, by the King's Son and Sem-priest, Khaemwese, justified." Khaemwese may have been crown prince for a very short while during his father's reign, after the death of his older three brothers. However, the brother in line just above Khaemwese was still crown price in year 52, and Merenptah who actually succeeded Ramesses II was crown prince in year 55. Khamwese died either late in year 54 or in year 55 of Ramesses II's reign. We are fairly certain that Khaemwese was buried in northern Egypt, perhaps at Saqqara or Giza. There has been no evidence found in the Tomb of Ramesses II's son to suggest he was buried in the Valley of the Kings. There was a mummy of of a middle aged man found in Khaemwese's beloved Serapaeum in 1851, and it has and continues to be speculated by Egyptologists that this is the body of Khaemwese. Found with the mummy were necklaces of semiprecious stones and amulets, along with a gold mask. However, Auguste Mariette, who discovered the mummy blasted his way into the bedrock above the crypts and so the mummy could have literally been blown from another tomb above. In addition, besides the fairly fine funerary equipment, there is no other evidence that the mummy is that of Khaemwese. Between 1991 and 1993, Japanese Egyptologists from Waseda University unearthed the remains of a limestone building about a kilometer north of the Serapaem. All about the building, limestone blocks were with the name and image of Khaemwese were scattered about. There were some 2,500 objects discovered in the ruins that date from the New Kingdom or later. Yet the building itself seems archaeologically to date to the Old Kingdom. Sakuji Yoshimura, the Japanese project leader, believes that the building was nevertheless constructed upon the orders of Khaemwese. It is clear that this son of Ramesses II had a great respect for tradition, and even studied the old buildings. Yoshimura believes Khaemwese deliberately built the structure in an archaic style. Now the big question, however, remains. Is this simply a religious center connected with Khaemwese, or could it somehow be connected to his tomb. 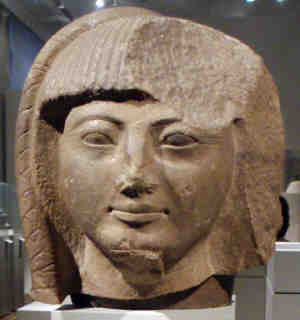 Prince Khaemweset (also translated as Khamwese, Khaemwese or Khaemwaset) was the fourth son of Ramesses II , and the second son by his queen Isetnofret . He is by far the best known son of the king, and his contributions to Egyptian society were remembered for centuries after his death. Khaemwaset has been described as "the first Egyptologist" due to his efforts in identifying and restoring historic buildings, tombs and temples. Khaemwaset grew up with his brothers during a time of foreign conflict. He apparently was present at the Battle of Kadesh , at the siege of Qode (Naharin), the siege of Dapur in Syria and earlier in Nubia. After this initial period where Khaemwaset may have had some military training, or at least was present at the battlefield, he became a Sem-Priest of Ptah in Memphis. This appointment occurred in c. Year 16 of Ramesses II's reign. He would have initially been a deputy to the High Priest of Ptah in Memphis named Huy. During his time as Sem-Priest Khaemwaset was quite active in rituals, including the burial of several Apis Bulls at the Serapeum. Khaemwaset restored the monuments of earlier kings and nobles, such as Shepseskaf, Sahure and Nyuserre Ini . He also restored the pyramid of Unas at Saqqara . He seems to have undertaken these tasks during his later tenure as Sem-Priest and some of the inscriptions mention his title as 'Chief of the Artificers' or 'Chief of Crafts'. Hence, some of these restorations were undertaken after Khaemwaset's promotion as the High Priest of Ptah in Memphis about the 45th year of the reign of Ramesses II. Khaemwaset held the position of Crown Prince to the throne between Year 50 and Year 55 of his father's reign when he died. He was succeeded in this position by his full brother Merneptah . He also served as Governor of Memphis . In later periods of Egyptian history, Khaemwaset was remembered as a wise man, and portrayed as the hero in a cycle of stories dating to Greco-Roman times. One example is the 'Stories of Setne Khamwas'. He is believed to have been buried at Saqqara, "perhaps below his hilltop sanctuary between Abusir and Saqqara." Whilst first exploring the Serapeum between 1851 to 1853, French Egyptologist Auguste Mariette was confronted by a huge rock, which could only move by the use of explosives. Once the shattered remnants of the rock were removed an intact coffin and numerous funerary treasures were discovered which contained the mummy of a man. A gold mask covered his face, and amulets gave his name as Prince Khaemwaset, son of Ramesses II and builder of the Serapeum. However these remains have now been lost, and Egyptologists believe that this was not the grave of Khaemwaset but were the remains of an Apis Bull made into a human form to resemble the Prince. "Designated Apis XIV, it comprised a wooden sarcophagus, largely embedded in the ground, with its upper part largely crushed. Inside, there was what had the appearance of a human mummy, its face covered by a somewhat crude gold mask, damaged by damp and bearing a considerable quantity of jewelery, some bearing the name of Prince Khaemwaset. In spite of its appearance, the mummy proved to be a mass of fragrant resin, containing a quantity of disordered bone. Although frequently stated to be the mummy of Khaemwaset, on the basis of its possessing his jewelery, the mass of resin containing bony fragments is far more reminiscent of the undoubted Apis of tombs E and G. Its formation into the simulacrum of a human mummy also finds echo in the anthropoid coffin lids that covered the resinous masses within the sarcophagi of Apis VII and IX, there can thus be no doubt that the burial is actually that of the the bull, Apis XIV." Kraemwase married Meheweskhe  [MRIN: 551617709].